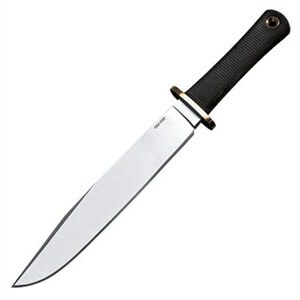 This SK-2 version of the Trail Master offers 9-1/2 inches of high carbon steel with an overall length of 14-1/2 inches and a weight of just over a pound. Although in frontier days it might have been one of the smaller Bowies, it's big enough and tough enough to do the same work today. The high carbon steel definitely takes a sharper and longer-lasting edge than high carbon stainless steel in the same price range. An occasional rub with light machine oil prevents rust and corrosion, and with time and hard use, the Trail Master will develop the dark patina of a classic knife. The size of the Trail Master may raise eyebrows today, but the extra weight and length put this knife in the same functional categories as machetes, camp axes, and short swords. The Trail Master handles camp chores and field dresses game, although it would be inefficient for delicate work like filleting fish. The Kraton handle's textured grip ensures a comfortable and safe hold when swinging the blade in wet conditions and includes a lanyard hole for extra security. The knife comes with a leather belt sheath. Two tests that Cold Steel ran on this knife will definitely impress you. Bending any modern blade to 45 degrees usually makes shrapnel, but the Trail Master survives. Jamming a knife point into a plank and then prying out chunks convinces me that there's little possibility of breaking the Trail Master. See the Cold Steel Gurkha Kukri for a different style of frontier knife.